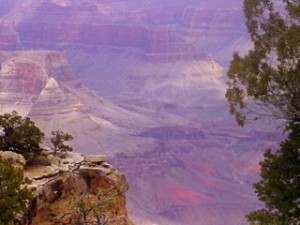 I was traveling out west in March 2008 with fiddler Jane Rothfield and guitarist Max Cohen and we visited the Grand Canyon. It was a beautiful day, clear, glorious and and majestic with the ravens soaring overhead as we walked the trail at the canyon’s edge. It was also a sad dy because my father was dying in Florida. As we left Hermit’s Rest, one raven landed in our midst. Fixing me with a beady eye, the bird whuffled its throat feathers in and out, clacked its beak and seemed to speak to me particularly. We were enthralled – I even snapped this photo. 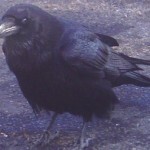 As the years have gone by, a raven comes often to visit in the yard. Not a crow, much bigger. Not the same raven, of course, but a relative. I greet him as if he were a a relation of mine. Who knows? Max and I play this tune at the Fiddlers Summit in Shepherdstown WV in 2010. Mother’s Day 2014: Impromptu jam on “Raven’s Wing” at La Grande Rencontre. Cathedral del Gesu, Montreal. With Bruce Molsky, Pierre Schryer, Quinn Bachand and Robin Bulliaume.